Why Should I Love You? Creating Enduring Loyalty In A Connected World. Alex Hunter is a branding and customer experience expert. He is also the creator and host of Attaché, a new style of online travel show, aimed at showing business travellers all they need to know in a very short film before visiting a city on company business. 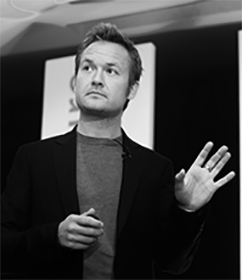 Previously, Hunter served as the global Head of Online Marketing for the Virgin Group, overseeing the Virgin brand’s global digital strategy in its entirety, as well as Sir Richard Branson’s personal digital strategy. Before joining the Virgin Group, Hunter was based in California at Virgin America, where he used the web to build a grassroots marketing campaign to garner public support for Virgin America’s certification process on a tight schedule and even tighter budget. The campaign was covered by Time magazine, CNN, and CNBC, amongst others. He also oversaw the front-end development of Virgin America’s website which has since won many accolades including ad:tech and Webby Award honours. Hunter most recently served as the Chief Executive of a venture-backed digital music company, with investment from the backers of Twitter, Tumblr, Medium, and Kickstarter. He steered the company through a successful international mergers and acquisitions deal, and significant multi-national growth in under a year. Hunter is a highly regarded public speaker, appearing all over the world at major industry events such as ad:tech, Future of Web Apps (London, Las Vegas, Dublin, and Miami) and Thinking Digital. Other clients include Cisco, Deloitte, Procter & Gamble, O2, Capital One, and the BBC.